The Chalk Emerald is one of the finest Colombian emeralds. It exhibits superb color and clarity than most of the other pieces. The Emerald is a 37.8 carat piece that has deep green color and is a highly prized jewel. According to the legend, the Chalk Emerald was once a centerpiece of the emerald and diamond necklace of a Maharani that lived in the state of Baroda in India. It was then re-cut and set in a platinum and gold ring designed by Harry Winston Company. 60 pear-shaped diamonds that have a total of 15 carats now surround the ring. The ring is on display in Gem Gallery at the National Museum of Natural History in Washington DC. Picture displayed at the top. Indians are known to appreciate gems and jewelry, which includes emeralds. The ancient Indian rulers were passionate about the green emerald as it was said to bring luck to their lives. One of the most famous pieces is Moghul Emerald. A massive 217.8-carat square gem is curved. It has an Arabic script with a Shia Muslim prayer. It also has a curving of rosette surrounded by poppies on the underside. The late President John F. Kennedy is said to have proposed to Jacqueline with a 2.84-carat emerald that was set on 2.88-carat diamond ring. It has an unusual crossover styled ring that also has baguette-cut diamonds that accented other stones. The ring was then remade with baguettes changed to round and marquise diamonds. After the death of the president, she had the ring brought back to the original setting in order to honor her deceased husband using his agreed design. Although Halle Berry was not engaged to any man at the time, she showed off her beautiful emerald engagement ring in 2012. The ring was designed by a famous designer called Robert Mazio and was presented to her by Fiancé Olivier Martinez. The ring featured a 4-carat emerald that was set on a yellow gold ring that had been brushed with a unique design. One each side of the ring was a colorless diamond attached to the body of the ring. Grace Kelly is an actress that joined the royal family by getting married to Prince Rainier of Monaco. The prince gave her a massive 12-carat emerald-cut diamond ring when he proposed to her. Grace loved the ring so much that she acted with it in her last film called ‘The High Society.’ In the film, there is also a line that relates to the stone; “some stone, did you mine it yourself?” The ring also features baguette diamonds on the either side of the emerald cut piece. The prince took inspiration from what many Hollywood actresses were wearing at the time and went a step higher in getting a bigger piece. The late Duchess of Windsor had a splendid 19.77-Carta Cartier emerald engagement ring that was set on a platinum engagement ring King Edward VIII had gifted her with the ring early into their relationship. To honor their 20 years of marriage, the Duchess too the ring back to the designer and had it remounted on a gold and platinum setting. However, she retained the initial setting a long with the inscriptions made on the ring for all her life. Angelina Jolie is one of the widely known celebrities. In the recent past, she has become the face of emeralds as she appears on many occasions dripping in several pieces of emerald jewelry. She goes full-scale in her emerald jewelry that includes a minimalist emerald necklace, emeralds earrings, and an emerald ring. She also loves wearing all black or all white getups. The green stones bring the allure of sophistication and style against her style every time she hits the floor. Her collection of jewelry is said to cost over $13.5 million. Beyoncé is also a lover of emeralds and emerald-cut diamonds. During her engagement period, her husband, Jay-Z presented her with an 18-carat emerald cut diamond. The ring had a simple band, but the stone was incredibly big and has a superb sparkle. In 2013 inauguration of President Obama, she made her presentation having worn a large green emerald ring that added style to her outfit. Several other celebrities including Mariah Carey and Kim Kardashian have also worn emeralds on several occasions. 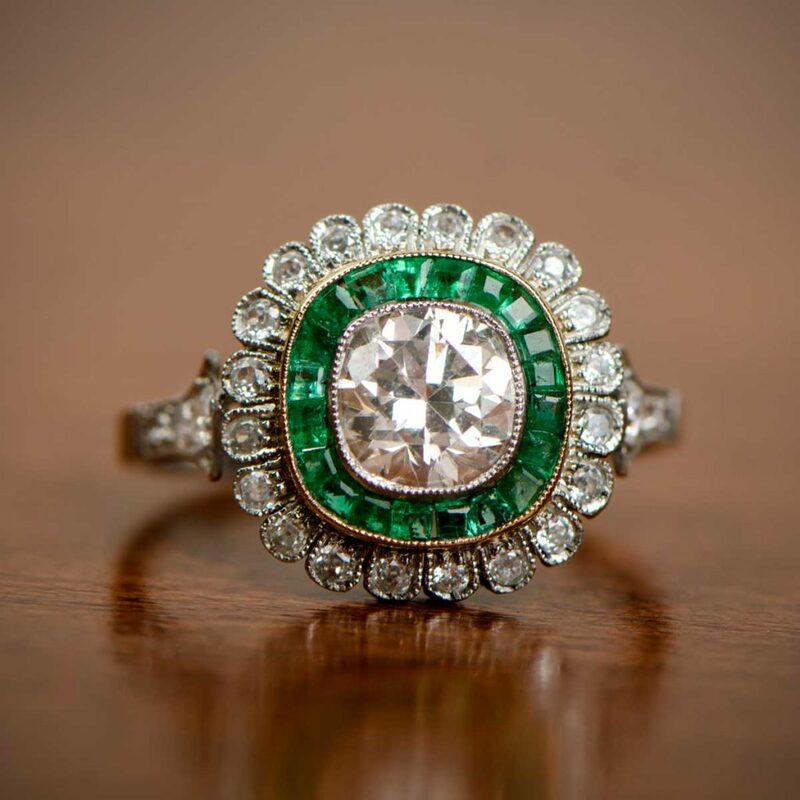 Emeralds are some of the most common stones used in rings especially the engagement and wedding rings. The green, bluish or green, yellowish sparkle is a darling to many.